When you photograph a tall building and tilt the camera upward to fit it all into the frame, an effect that’s referred to as convergence, or keystoning, occurs. This effect causes vertical structures to tilt toward the center of the frame. Buildings sometimes even appear to be falling away from you, as shown in the left image. (If the lens is tilting down, vertical structures instead lean outward, and the building appears to be falling toward you.) Using the Retouch menu’s Perspective Control feature, you can right those tilting vertical elements, as done to produce the second image. 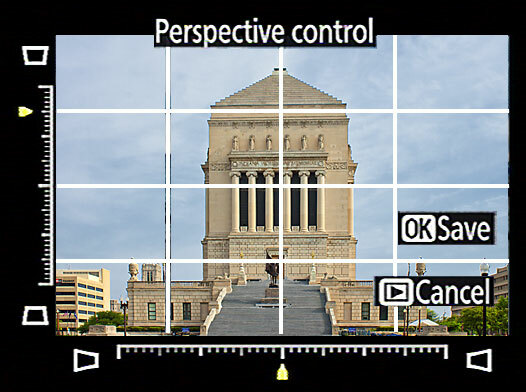 Note, though, that as with the Straighten, Distortion Correction, and Fisheye tools, the Perspective tool results in some loss of area around the perimeter of your photo. So again, when shooting this type of subject, frame loosely — that way, you ensure that you don’t sacrifice an important part of the scene due to the correction. After you select the filter, you see a grid and horizontal and vertical scale, as shown. Press the Multi Selector left and right to move the out-of-whack object horizontally; press up and down to rotate the object toward or away from you. When you’re happy with the results, press OK.
Again, use the Multi Selector to manipulate the image.